The 11-story Hayward Building, built in 1901, is unique in that it is the only building in the Financial District to have survived the Great Earthquake. However, it was hardly the only building in the Bay Area to be built at the behest of spirits. In fact, the spirits had been quite ambitious in this endeavor of late, and had no shortage of wealthy patrons. In 1884, the same year that Alvinza Hayward struck gold with the help of a medium, construction began at the Winchester Mystery House in order to house the spirits of the people killed by Winchester rifles. The following year, the cornerstone was laid at Stanford University, which was built as a memorial for Leland Stanford Jr., who continued to communicate with his family following his death in 1884. When miner Charles Lane first purchased “The Invincible” mine for $10,000, everyone thought he was either a fool, or a complete lunatic. The mine had been abandoned in quick succession by each of the previous owners, including mining expert James Fair. The claim was considered so unworkable it had recently exchanged hands for a meager 50 dollars. Rumor was that the mine had long since been played out and the ground had been “salted” (sprinkled with minerals) in order to unload it on a gullible buyer. Lane’s wife surely strongly objected when her husband proposed to spend their entire life savings on such an unpromising venture, but Charles Lane insisted, and in 1880, purchased the abandoned mine outside Angel’s Camp and renamed it the Utica. Charles Lane spent every last penny he had, every man hour he could muster, dug thousands of feet of underground tunnels and went deep into debt, but his efforts yielded no results. One by one, his partners sold off their shares, and Charles Lane was left the last man standing, with not enough money to feed his own family. He could have given up hope and moved on, as had his partners, and as he had done himself so many times in the past, but this time, Charles Lane refused to give in to the nagging voice of doubt. Instead he allowed himself to be guided by voices from beyond, and continued toiling underground for years without reward. Until one day, he struck the richest gold vein in the State of California. Lane was fueled on by the advice of a San Francisco fortuneteller named Mrs. Robinson. Mrs. Robinson had a unique talent. She claimed she could divine the value of a gold deposit just by holding a piece of quartz from it’s vein. Lane brought her a sample from his claim and she held up the rock and proclaimed “This is your fortune.” Lane was still doubtful, and hanging by a thread financially, so he consulted with 49er and mining pioneer Alvinza Hayward. One of the original ’49ers, Alvinza Hayward was often described as flamboyant and eccentric. Hayward had founded the “Old Eureka” mine in 1850, and obtained interest in the Comstock Lode of the 1860’s. 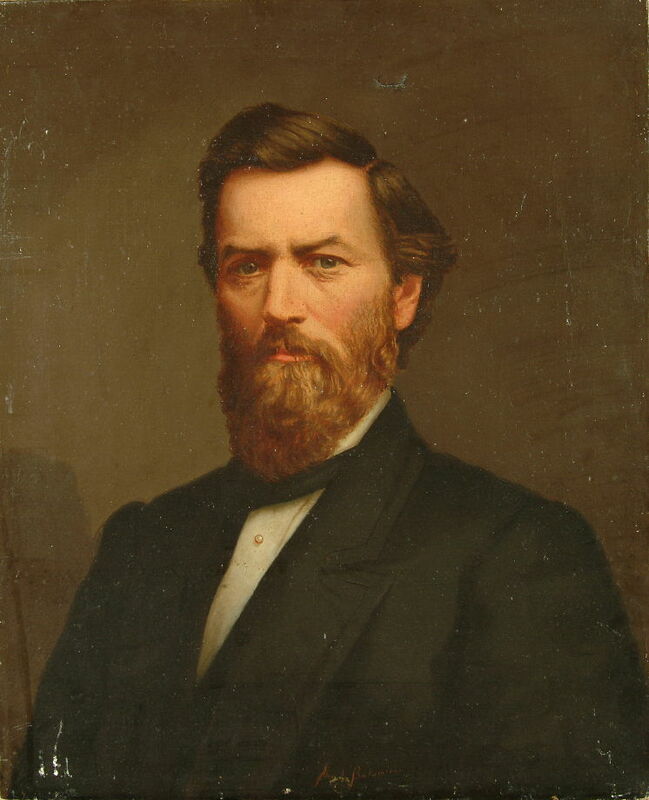 In the 1870’s, he was one of the principle investors in the San Francisco City Gas Company, and director of the Bank of California. 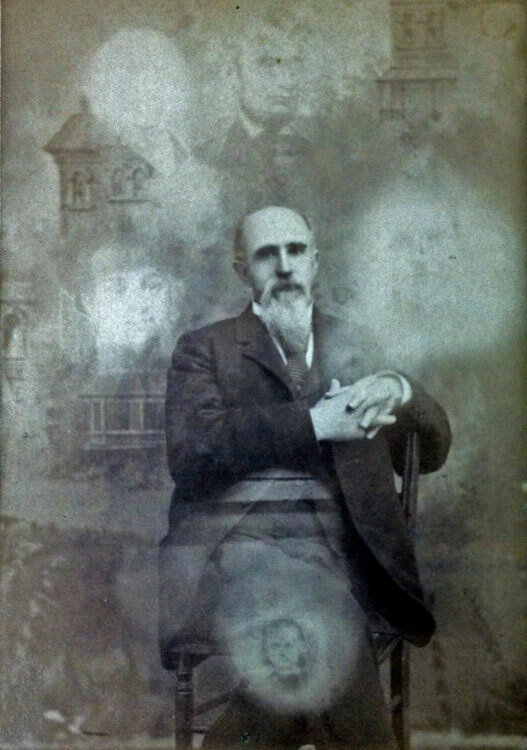 Hayward was an avowed Spiritualist who regularly sought the advice of the spirits. Hayward even had his own personal medium on payroll, who was also adept at divining quartz, so Lane shrewdly sent Hayward a sample in order to get a second opinion. Hayward’s medium confirmed Lane’s speculations, securing Hayward’s partnership in the process. With the financial backing of Hayward and his partner Hobart, Lane continued his labors underground. After several years of work, he was able to pull enough out of the ground to feed his family, but not nearly enough to guarantee a return for his investors. Hayward’s partner Hobart was not a Spiritualist, and was not about to continue to invest large sums of his own money in a played out claim on the advice of a fortuneteller. Hayward’s own wife thought him a fool, and started putting property in her name so that neither the spirits, or the Spiritualists, could get their hands on them. Charles Lane and Alvinza Hayward were considered crackpots, hapless dupes at best, and their loved ones were concerned they could no longer afford to support them in their delusions. They need not have worried. The Utica Mine turned out to be the Mother of the Mother Lode: the single largest gold producing vein in the state. From 1893 to 1895 it yielded 4 million dollars in under 30 months. For much of he 1890’s, the Utica Mine was the largest source of gold in the country. It’s total output was valued at over 16 million dollars when it closed down in 1910, which is about a billion dollars by today’s standards. When Hayward first received the news of the Utica bonanza, he was dismayed that his partner Hobart had not only died before Hayward could be vindicated, but that he was too proud or too stubborn to reach out from beyond the grave and admit when he was wrong, and just plain mean to not reveal the location of the bonanza. According to ledgers, Hayward and Lane’s fortuneteller charged up to a $1000 for her regular consultations and made an estimated $80,000 in finder’s fees, far more than any mining engineer or geologist could hope to make. In order to pay back the spirits for their guidance, Alvinza Hayward used his Utica gains and hired the top architects in the city, George Percy and Willis Polk, to build the tallest skyscraper in San Francisco. 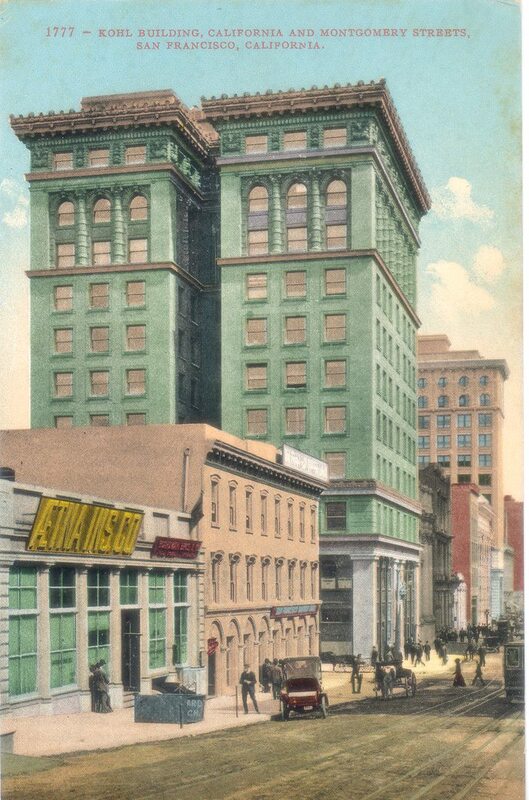 The Hayward Building at 400 Montgomery, now known as the Kohl Building, was Willis Polk’s first commercial commission, and the only building in the Financial District to survive the Great Earthquake. Some say that this is because it was protected by spirits, but other’s attribute it’s survival to it’s unique H-shape, metal framed windows, and close proximity to the Merchants Exchange building which sheltered it from the flames. Hayward and Lane forged a lifelong partnership and continued to trust mediums to guide their investment choices, but it didn’t always work to their advantage. They once sold a mining interest for next to nothing per the advice of a medium, but 400 feet later, the new owners struck gold. The Utica’s treasures did not come without a price. While many prospered from the Utica mine, many more perished and met their ruin. Despite the unusually lucky find, the Utica mine quickly gained a reputation as an unlucky mine, and many miners refused to work it. Superstitious or not, no one could deny that more accidents happened at the Utica mine that at any other in Calaveras County. Lane and Hayward, envied as two of the luckiest and wealthiest men in the world, also suffered much personal misfortune after the Utica bonanza. While overseeing construction on a claim in Alaska, (appropriately named the “Wild Goose”) Charles Lane, who didn’t make his fortune until late in life, was stricken with snow blindness, and spent his final years as a blind man. Hayward had so many of his children die that historians have speculated that his wife may have had Munchausen’s by Proxy. Whatever the cause, only two of his eight children survived until adulthood. Lane and Hayward’s friendship did not suffer the same ill fate. As testimonial to the strength of their bond, Alvinza Hayward died in the home of Charles Lane, with Lane at his bedside. One thing did manage to survive the rise and fall of the Wheel of Fortune however. As a lasting monument to Lane and Hayward’s legacy of unshakable faith, betting against all odds, and perseverance in the face of adversity, the Hayward Building at 400 Montgomery still stands tall. Wow. Thanks. I’m certainly glad you approve! Thank you for your time and effort in writing this! I had a lot of fun doing so! It’s a fantastic story. Your g-g-grandfather was quite the character!! Awesome write-up! 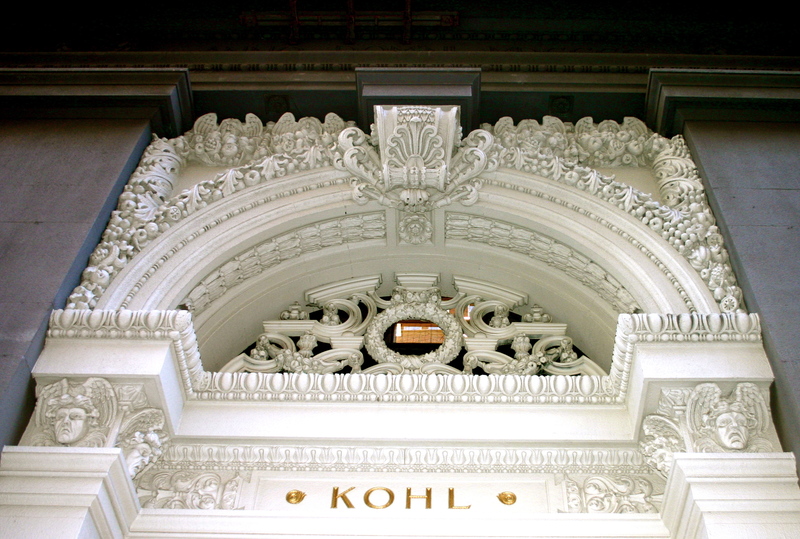 I work in the Hayward/Kohl building, and it was interesting learning some of the history of this amazing building. I feel very proud now to work in this building, still standing after all others fell!